You are here: Home / Financial Services / A-Mark Precious Metals, Inc.
A-Mark Precious Metals, Inc. ("A-Mark") is the largest private distributor of bullion coins and bullion gold, silver and platinum to the wholesale marketplace in North America with over $2.5 billion in revenue. The Chairman and sole owner of the Company desired liquidity from a transaction. M&A Capital targeted a broad universe of financial and strategic buyers and ultimately the Escala Group (formerly Greg Manning Auctions) was selected as the best buyer. Greg Manning Auctions and Afinsa Bienes Tangibles, S.A. of Madrid, its majority shareholder, were partners on the transaction, with Greg Manning Auctions acquiring 80% of the outstanding common stock of APM and Afinsa acquiring the remaining 20% interest through a wholly owned subsidiary. 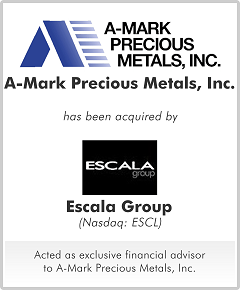 A-Mark maintained its existing $50 million syndicated line of credit, thus providing a seamless transition of financing under Escala Group.